The Ingenuity Baby Base 2-in-1 Booster Seat is perfect for playtime, dinnertime, and table-top activities. This clever booster is designed to support your little one as they sit, helping baby learn to engage with the world in a new way. With the Ingenuity Baby Base 2-in-1 Booster Seat, your little one can take their place at the table. This stable seat easily adapts from floor seat to booster seat: simply use the safety strap to fasten the seat to an adult dining chair. The 3-point harness keeps your baby secure in the seat, whether they’re reaching new heights on the dining chair or sitting up to play on the floor. The soft foam insert makes the Ingenuity Baby Base 2-in-1 Booster Seat extra comfortable for infants, and can easily be removed to make room for your little one as they grow. 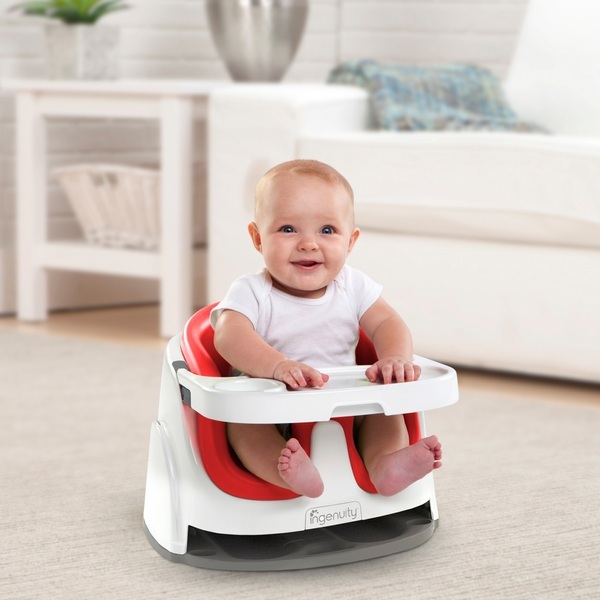 There’s even a removable tray with a cup holder, offering little ones a stable surface for meals and activities. The tray is dishwasher-safe for your convenience, and can be neatly stored beneath te seat to save space and maximise portability. This lightweight seat is the perfect companion for trips away, easily adapting dining chairs to highchairs wherever you and baby go. EU Warning: Intended only for children who can sit unaided. Do not use in motor vehicles. Remove all packaging before using product.